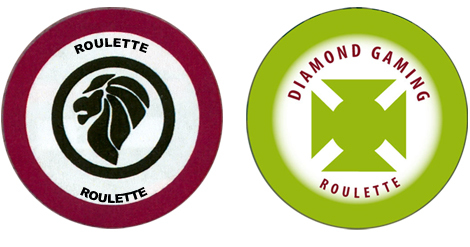 Our Roulette Chips are ceramic-based, weigh 10.5 grams each and can be custom printed with your design/logo. 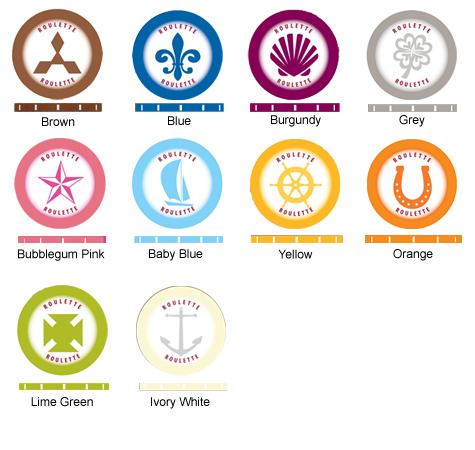 You can choose from a wide selection of Roulette Chip colors and styles, including: Horseshoe/Orange, Sail Boat/Blue, or Shamrock/Grey, and more. 500 Chip minimum order to place your order online. You may also custom print your Roulette Chips. Choose from 10 different Roulette Chip Colors. No setup charge for stock designs above; mix all ten colors (50 piece minimum per color) at no additional charge. For your custom logo with different edge colors, setup is $100.00. Feel free to browse our other casino products including our Ceramic Casino Chips and our Casino Night Supplies. For Free Chip Samples and a Catalog, wholesale pricing, or additional information, please contact us at 1-800-233-0828.